Gasparilla Gold is a brand of smoked pork snack sticks owned by Beepco, Inc., based in Ocala, FL. The family-run company goes back 30 years making and selling its snack sticks through school groups for fundraising. Today, it’s run by the three sons of the original owners who moved the business into a larger manufacturing facility to grow its Gasparilla Gold brand. Thus far, the company is targeting retail locations in the South Eastern states, with plans to distribute globally. Gasparilla Gold are made with lean fresh meat, smoked for 18 hours, adding premium blended seasonings, with zero trans fat. Originale – A mild flavor with a balance of sweet and smokiness, touched by a light seasoning. Barbeque – Just a little bit more spicy than the Originale, but with a clearly distinguishable barbecue sauce flavor, though not overpowering. There’s a bit of tanginess in the chewing, and still a noticeable sweet and smokiness. Cajun Style – Less sweet than the Originale and the Barbeque, with a clearly higher spiciness, and a moderate amount of heat. These have a light vinegar flavor, comparable to what you might find in chile pepper sauce, but still allowing some of the smokiness to come through. I can also taste the unique seasoning blend in this, and find bits of red chile peppers inside. The meat consistency in all three flavors is by far, less oily than major brands of snack sticks, perhaps because there seemed to be a more meat and less fat than found in major brands of sticks. The skin on these sticks are very easy to chew, offering just a slight bit of snap, but never resulting in anything chewy or tough. The Originale tended to have the highest amount of smokiness and sweetness, while the Cajun Style tended to be much less sweet, but much more spicy. I liked the Barbeque the best. It has the best balance of sweet, spiciness, and smokiness. I did, however, think the Cajun Style had a softer, meatier chew. 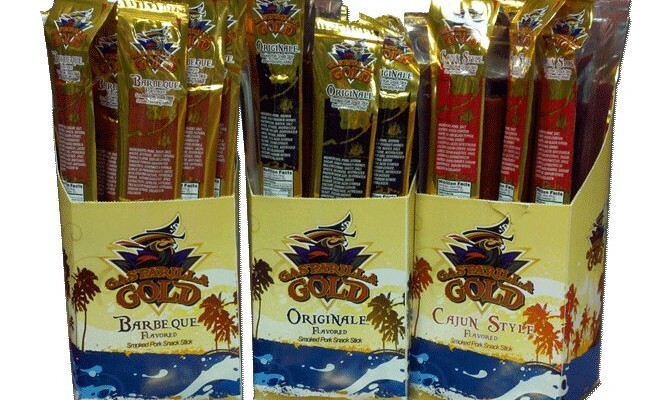 Overall, snack stick fans will definitely appreciate smokiness and rich seasonings of Gasparilla Gold snack sticks compared to major brands. I also liked the cleaner handling, not getting any of the greasiness on my fingers like I do with other brands. Next time you think about stocking up on some sticks, give Gasparilla Gold a try.